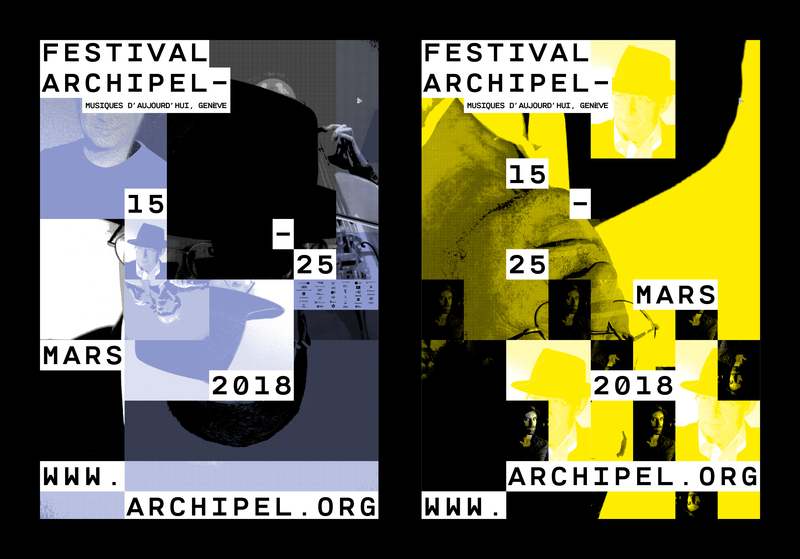 Archipel is the main Swiss festival totally dedicated to contemporary music. Our goals were to create the visual identity of the 2018 edition entitled Ecce Robo; whose theme was the relationship between man and machine in music creation and illustrate the impact of AI on creation. For this project, we have developed an algorithm that creates different and unique posters, all in a series of 500 specimens. In direct connection with the theme of the 2018 edition, this work explores and questions the relationship between man and machine in the field of creation. The peculiarity is that the algorithm deals with creating entirely each poster. It creates the image of each poster as well as the layout of the text information (festival name, dates and internet address). The notion of creativity lies more in writing the script to define the framework and the set of rules than in the final result. By accepting to lose some control and being surprised, the machine becomes a creation assistant to amplify our creativity, expand our field of research and offers new perspectives of creation if we use the algorithm in as a parameterizable tool according to our needs. We have also designed for this project a custom typeface, perfectly adapted to the needs of the algorithm. Within this concept, other communication deliverables were also developed, including a program, flyer, press announcement, signage, tickets, stationery .